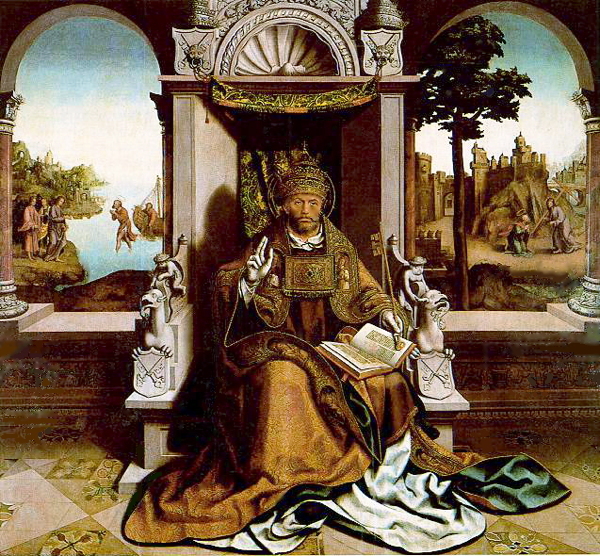 Feb 22 – Chair of Peter, Sermon by Pope St Leo the Great, Doctor of the Church, (400-461 AD) | ADULT CATECHESIS & CHRISTIAN RELIGIOUS LITERACY IN THE ROMAN CATHOLIC TRADITION: hosting ONLY True Christians!! !, or "How to think Catholic!!" The Church of Christ rises on the firm foundation of Peter’s faith. “Out of the whole world one man, Peter, is chosen to preside at the calling of all nations, and to be set over all the apostles and all the fathers of the Church. Though there are in God’s people many shepherds, Peter is thus appointed to rule in his own person those whom Christ also rules as the original ruler. Beloved, how great and wonderful is this sharing of His power that God in His goodness has given to this man. Whatever Christ has willed to be shared in common by Peter and the other leaders of the Church, it is only through Peter that He has given to others what He has not refused to bestow on them. The Lord now asks the apostles as a whole what men think of Him. As long as they are recounting the uncertainty born of human ignorance, their reply is always the same. But when He presses the disciples to say what they think themselves, the first to confess his faith in the Lord is the one who is first in rank among the apostles. Peter says: You are the Christ, the Son of the living God. Jesus replies: Blessed are you, Simon Bar-Jona, for flesh and blood has not revealed it to you, but my Father Who is in heaven (cf Matthew 16:16-17). You are blessed, he means, because my Father has taught you. You have not been deceived by earthly opinion, but have been enlightened by inspiration from heaven. It was not flesh and blood that pointed me out to you, but the one whose only-begotten Son I am. He continues: And I say to you (Matthew 16:18) In other words, as my Father has revealed to you My godhead, so I in My turn make known to you your pre-eminence. You are Peter (Matthew 16:18) though I am the inviolable rock, the cornerstone that makes both one (cf Isaiah 28:16, Ephesians 2:14), the foundation apart from which no one can lay any other, yet you also are a rock, for you are given solidity by My strength, so that which is My very own because of My power is common between us through your participation. And upon this rock I will build My Church, and the gates of hell shall not prevail against it (Matthew 16:18). On this strong foundation, He says, I will build an everlasting temple. The great height of My Church, which is to penetrate the heavens, shall rise on the firm foundation of this faith. The gates of hell shall not silence this confession of faith; the chains of death shall not bind it. Its words are the words of life. As they lift up to heaven those who profess them, so they send down to hell those who contradict them. Blessed Peter is therefore told: To you I will give the keys of the kingdom of heaven. Whatever you bind on earth is also bound in heaven. Whatever you loose on earth shall be loosed also in heaven (Matthew 16:19). *From sermon 4 de natali ipsius, 2-3: PL, 54, 149-151 by Saint Leo the Great, pope.